Copyright © John Coyne. All rights reserved. Used with permission. 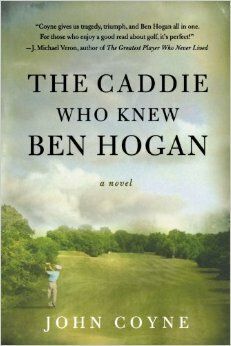 THROUGH THE YEARS, I’D SEEN BESTSELLER golf novels: Dan Jenkins’s Dead Solid Perfect about the pros on the PGA Tour; Steven Pressfield’s The Legend of Bagger Vance, a fictional account of a match involving Bobby Jones and Walter Hagen; but none about the player who dominated my childhood years: Ben Hogan. There are hundreds of stories about Ben Hogan. As a kid caddie I’d listened to club members swapping tales of Hogan’s intensity and mysterious ways of tournament play. And Hogan’s photos were constantly on the sports pages as he won one golf tournament after another. Still, it wasn’t until Mark Frost’s The Greatest Game Ever Played came out, and after those Little Red Books on golf instruction by Harvey Penick were published, that I decided to write a novel about golf myself. Perhaps it was Tiger Woods who finally made me do it. Everyone said Tiger would rewrite the record books, breaking all of Jack Nicklaus’s and Arnold Palmer’s records. But what about Ben Hogan? Why had his name slipped off the list of golf legends? Someone had to bring back to life my childhood hero, and I wanted to do it by making Hogan a character in a novel. And what a character, this “Wee Ice Man,” as Scottish golf fans lovingly called him when he played and won the British Open in 1953. Hogan was, as the cliché goes, right out of central casting. A poor Texas boy, slight of stature, without a high-school education; he was raised by a single mother after his father committed suicide. Turning pro as a teenager, he failed three times to make it on the PGA tour, but in the 1940s he came roaring out of Texas to dominate professional golf. In 1946 he played in thirty-two events. He won 13 times, finished second in six, and finished third in three. Among the tournaments he won was his first major—the PGA Championship—and if he had made some putts on the final holes, he might also have won The Masters and the U.S. Open. A year later he led the tour again, winning seven times, and in 1948 he added ten more victories, including his second PGA Championship and his first U.S. Open. Eight months later he nearly lost his life. In the winter of 1949, after a terrible automobile accident on a Texas highway, Hogan was told he might never walk again, but he did walk again and, with extraordinary determination, managed to return to golf 19 months later to win the U.S. Open, a victory that even today is called one of sport’s most inspiring performances. Hogan would go on to win the Masters, another U.S.Open, and the British Open within a span of twelve weeks, and when he returned from Great Britain in 1953, he became the first golfer since Bobby Jones to get a ticker-tape parade down lower Broadway in New York. A movie of his life called Follow the Sun was made with Glenn Ford playing Ben, although Hogan was his own stand-in when it came to making the famous golf shots. So, in my small attempt to save Hogan from the dustbin of history—and fully engaging my golfing muses—I typed a title into my Dell laptop in 2003: The Caddie Who Knew Ben Hogan. This novel, I decided, would be about a kid caddie growing up after the war as much as it would be about the great Ben Hogan. Then I wrote an opening sentence: Memories are magic. But this book would not be just pages of nostalgia for “the good old days.” As a novelist, I knew I had to engage readers who did not play golf and the only Hogan they knew was called Hulk. I wove into the narrative a love affair between the young assistant golf professional and the daughter of the country club president, using my fictional exclusive club setting as a lens into the social fabric of Midwest society in the 1940s. With literary nods to John O’Hara and J.P. Marquand, both writers of the ‘40s who used golf as a way to comment on the social stratification of the age, I let the love affair between the beautiful young woman and the golf professional be the focal point of class and society of the times. I let my caddie tell his own story from the vantage point of 40 years later when, now a retired university professor, he returns to the country club of his youth and recalls, for the assembled sons and daughters of the members he once knew, that time in America when life was simpler and heroes like Ben Hogan were truly great men, or so we wished to believe. But life was not simple, nor were men finer in those long-ago days, as the narrator remembers, and that, with plenty of golf in between, is the story I tell in The Caddie Who Knew Ben Hogan. As a novelist, I abandoned the novels I had written previously, mysteries and novels of the occult. But had I? John Coyne is a bestselling author of three golf novels, including The Caddie Who Knew Ben Hogan, and more than 20 other books. Pay him a visit at John Coyne Books.